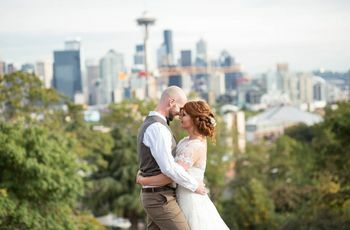 A major perk of getting married in Seattle is that the region’s unparalleled natural beauty is never far out of reach, even in the middle of a metropolis. These Seattle wedding venues on the water combine the best of city living with gorgeous views of Washington’s famous scenery, from the Puget Sound to Mount Rainier and the Olympic National Forest. If you’re hosting a PNW celebration, these Seattle wedding venues with a view are sure to wow you and your guests. Here are nine stunning Seattle wedding venues on the water. 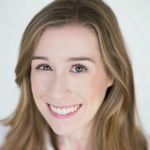 If you like the idea of getting married at a hotel but want a wedding venue with more of a boutique, artistic style, check out The Edgewater Hotel in downtown Seattle. This modern hotel, which has a prime location along Elliott Bay, provides more than 10,000 square feet of event space in seven unique rooms. The Edgewater Hotel also offers a variety of wedding packages and event coordination options to lighten your load during the planning process. Seattle couples who are willing to venture away from the city are sure to fall in love with the Alderbrook Resort & Spa in Union, Washington. 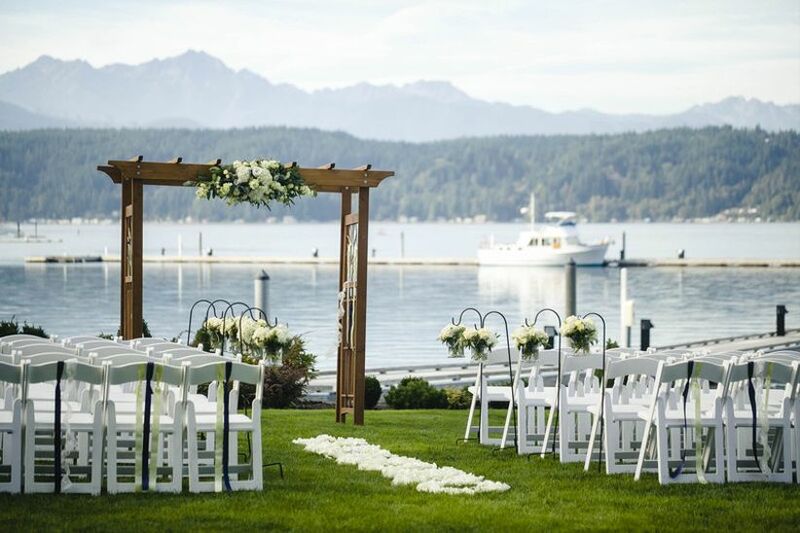 Located on Hood Canal, this picturesque Seattle venue is about an hour and a half drive from downtown. 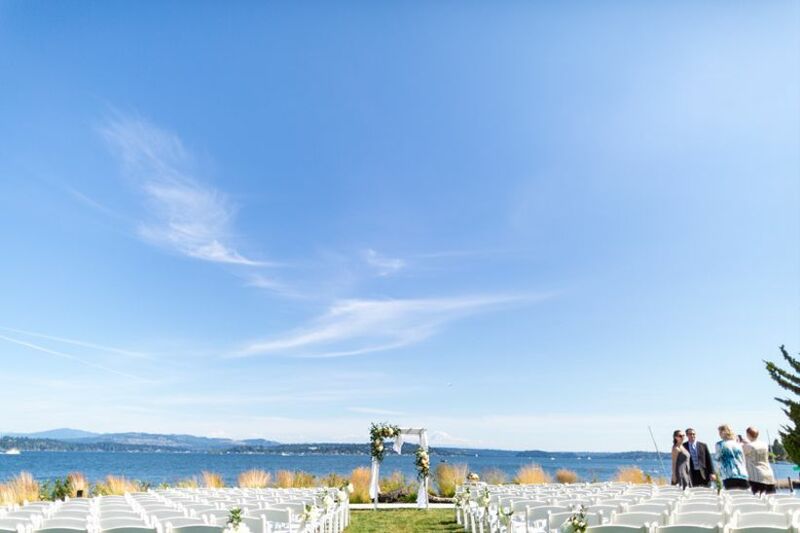 In addition to having a gorgeous waterfront view, you’ll also have the Olympic Mountains as your backdrop if you opt for an outdoor ceremony. The resort has plenty of rooms to accommodate you and your guests, but we personally love the charming private cottages. 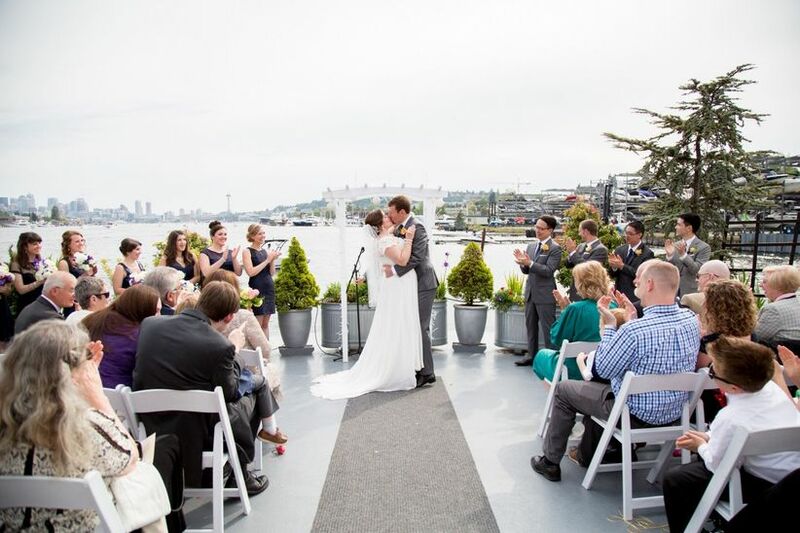 When it comes to Seattle wedding venues on the water, you can’t get more waterfront than The MV Skansonia. It’s a historic ferry boat that is permanently docked on Lake Union, and it offers an amazing view of the Seattle skyline. The boat itself is full of vintage charm, with Edison bulb string lights, eclectic nautical decor, and porthole windows. This all-inclusive venue provides catering, linens, china, glassware, tables, chairs, and more for your wedding day. With a central downtown location, this Seattle wedding venue on the water is an excellent choice for your big day, but it's also one of the best spots in the city to accommodate out-of-town guests. 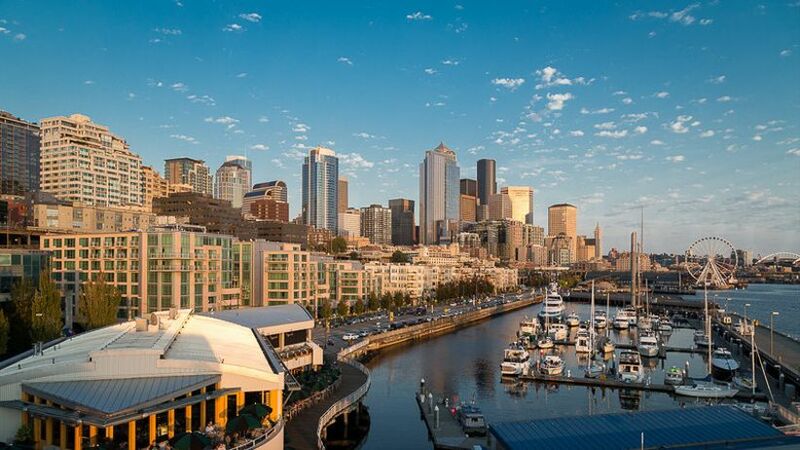 The Seattle Marriott Waterfront is a short walk to all of the city's must-see attractions, including the Seattle Aquarium, the Great Wheel, and Pike Place Market. For ceremonies and receptions, you can choose from a 7,000 square-foot ballroom or a bay front restaurant with an adjoining outdoor patio. Event planning and catering are both provided by the venue, so get ready to breeze through that wedding checklist! 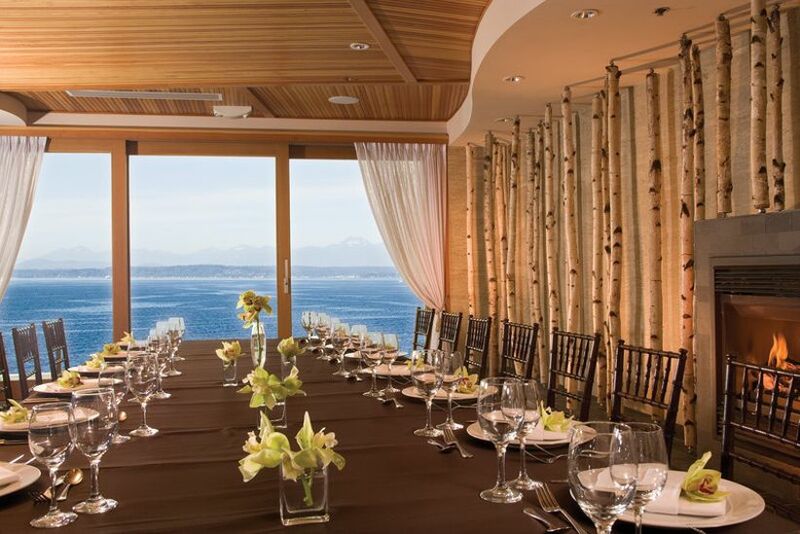 Bell Harbor International Conference Center is one of the most versatile Seattle wedding venues on the water. 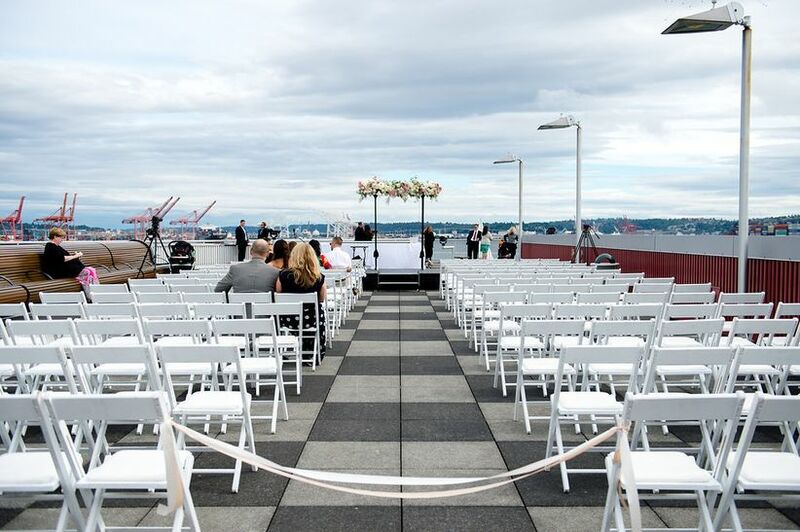 If you want an outdoor ceremony, the venue’s rooftop plaza has incredible 180-degree views of Elliott Bay, Mount Rainier, and the Olympic Mountains. Indoors, the Harbor Room is a traditional banquet room featuring a waterfront terrace and space for 300 guests. Bell Harbor’s sister venue, the World Trade Center Seattle, sits across the street from the conference center and is another option for your big day. Floor-to-ceiling windows at the World Trade Center Seattle fill the room with natural light while also showcasing the beauty of the waterfront location. The Seattle Tennis Club is a standout choice among our favorite Seattle wedding venues on the water. Couples can choose from elegant ballrooms and banquet rooms for indoor wedding receptions, but the most noteworthy space at this venue is, hands down, the waterfront lawn. 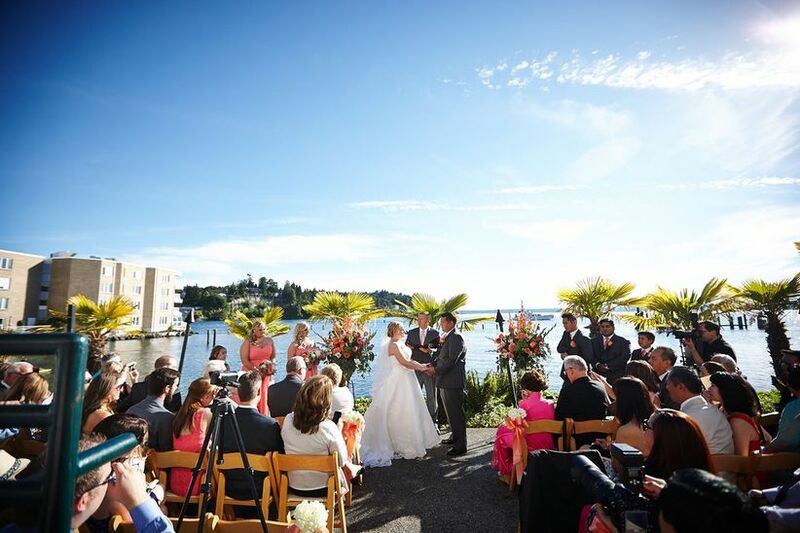 It’s the perfect spot to host a beautiful waterfront wedding ceremony, just steps from Lake Washington. The Seattle Tennis Club provides full-service catering and event planning. We’re in love with this rustic chic venue. 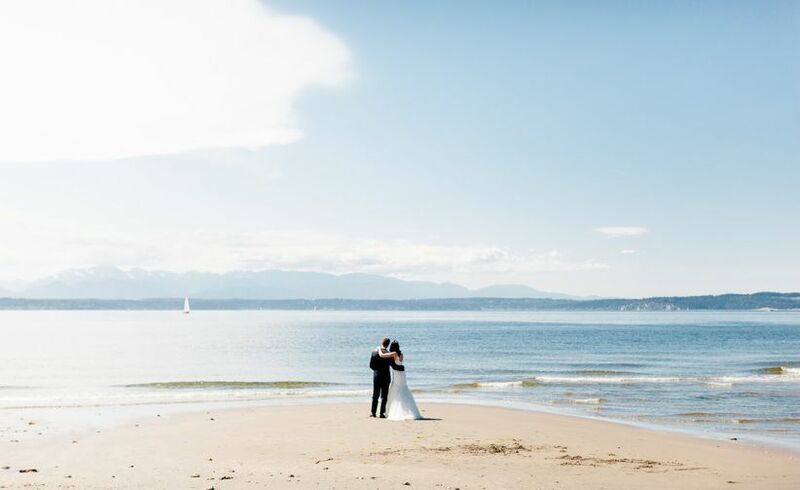 It's perfect if you're looking for unique Seattle wedding venues with a view — the Golden Gardens Boathouse sits along the shore of Shilshole Bay, providing you with a beach-meets-industrial vibe for your big day. 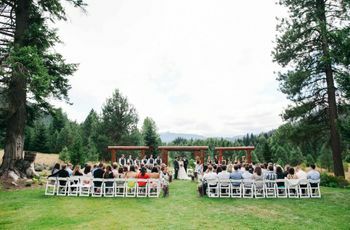 The venue is about 30 minutes north of Seattle, and you can choose from several indoor and outdoor spaces for your wedding. 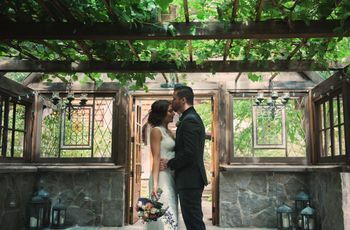 An enclosed brick pavilion (pictured above) can accommodate up to 140 guests and features cool details, like bistro string lights, exposed beams, and factory-style windows. Located in Southport between Seattle and Tacoma, the Hyatt Regency Lake Washington is an ideal venue for couples who want a modern, updated space. 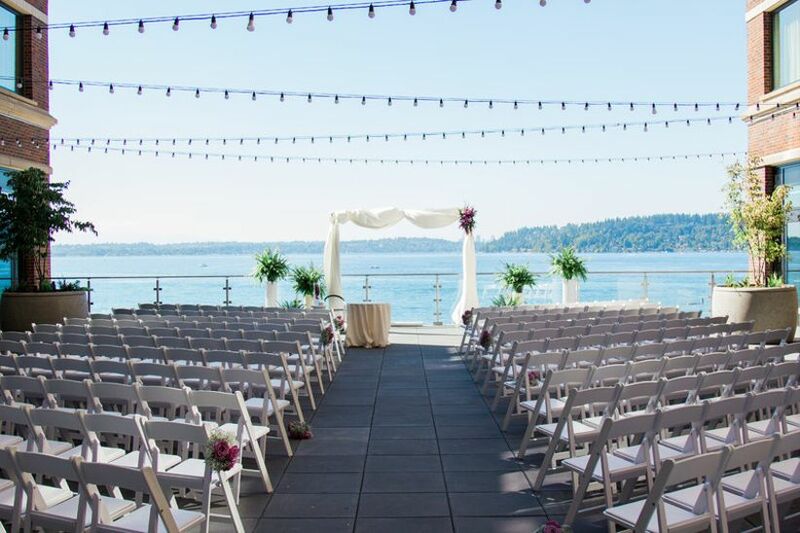 The gorgeous lakefront terrace is perfect for an outdoor ceremony, with photo-worthy views of the water, Seattle Skyline and Olympic Mountains in the distance. Inside the venue, a variety of ballrooms can accommodate guest lists big and small (up to 1,000 people) for your Seattle reception. The Ballard Bay Club is a short 25-minute drive north of downtown Seattle and is located on Shilshole Bay Beach. 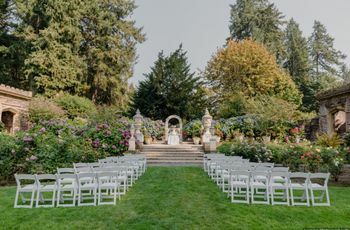 A spacious waterfront patio at this Puget Sound wedding venue is a beautiful setting for an outdoor ceremony, but all of the club’s indoor event spaces have water views as well. 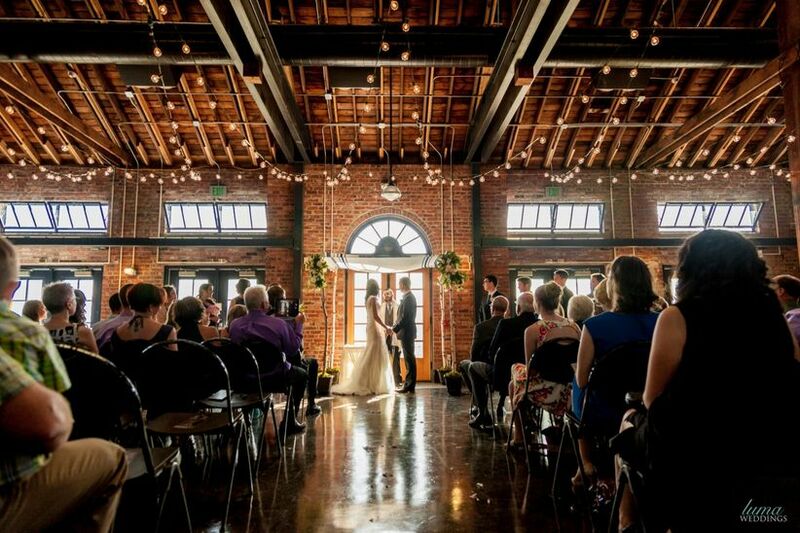 The reception rooms at Ballard Bay Beach Club feature exposed brick walls and hardwood floors, and the venue can host events for up to 400 people. Catering, event set-up, bartending, and various decorative items are all included with the rental fee.